Discovered and mentored by the great band leader Bert Ambrose, Kathy Kirby was groomed in the image of his ideal woman – a kind of late 1950s hybrid of Marilyn Monroe and Diana Dors, with crisply styled peroxide hair and startlingly glossy red lips. Ambrose’s concept was dated even by the time Kirby became a major television star on the strength of her early 1960s appearances inStars and Garters. But somehow – largely thanks to a winning and cheerful personality that knew instinctively how to reach a television audience beyond the camera and, crucially, a voice of spectacular power and emotional force, which commanded attention whatever she was singing – she transcended the stylistic straightjacket he imposed on her. 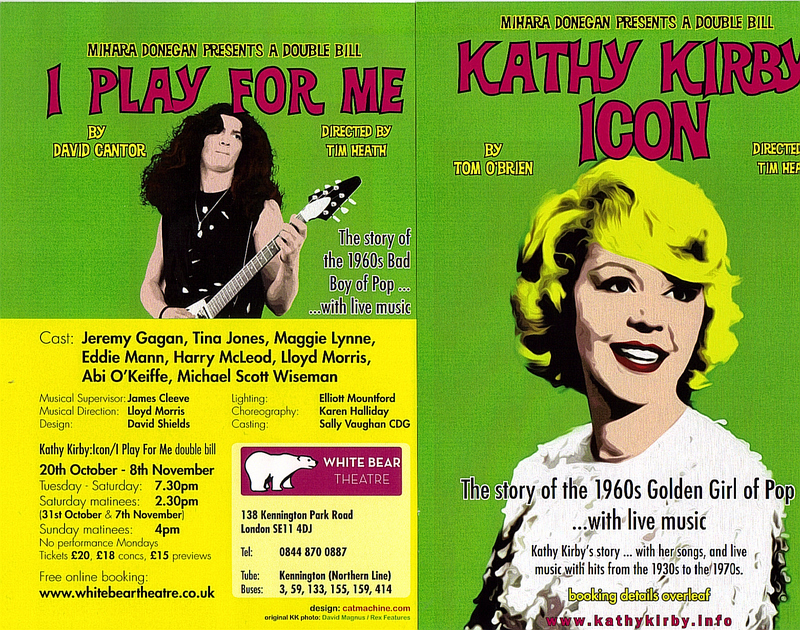 A new play, KATHY KIRBY: ICON, running at THE WHITE BEAR theatre, Kennington, sets the record straight about Kathy’s life,both in and out of the glare of publicity.